Times are Eastern Standard Time (GMT -5 hours), and are calculated for the longitude and latitude of New York City. Note that they have not been corrected for US Daylight Saving Time; at the time of this writing, that means adding an hour for those times between the second Sunday in March and the first Sunday in November. This is to make it slightly easier for anyone outside the US to adjust the times for their location. Surprise! The common definition of a blue moon is wrong! Along with many others, I used to believe that a "blue moon" was a month with two full moons. However, research by Sky and Telescope shows that this was due to an error made by the magazine in 1946. The original definition is the third full moon in a season with four full moons (instead of the usual three). For my part, I like the original definition better. It relates one astronomical event, a full moon, with another astronomical marker, the solstices and the equinoxes. The "new" definition uses an imposed time scheme, the Gregorian calendar. So from now on, I'm going by the old definition. If you prefer the newer definition, or you want to look for a "black moon" (the second new moon in a month)... well, you've got eyes and you've got a mind. Look for yourself in the table above. 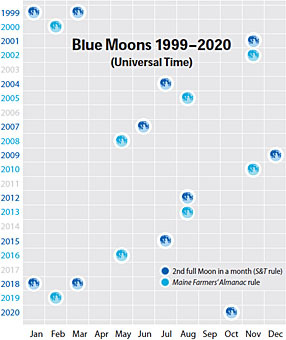 For either definition, consult this chart from Sky and Telescope for the dates of the blue moons until 2020; after that there's this chart which will take you to the end of the century. There are other definitions of a "blue moon." Someone wrote me with an obscure astrological definition: the second full moon that occurs in the same sign. There is also a drink called the Blue Moon, but I have found more than one recipe. The moon can appear blue as a result of rare meteorological conditions. Of course, there's always the conversational meaning of "a rare occurrence." For my part, as you can read below, I have no plans to research other definitions of the term. I only plan to revise this web page further once in a blue moon. There are lots of lunar links on the MoonMenu page of Selznick Scientific Software. Some common blue moon questions are answered on Obliquity. These books give you all the bits and pieces of astronomical calculations, which you can fit together as you like. It's not harder than, say, building a plastic model from a kit and then putting the model in your own diorama. Even if you have no additional software for your computer, you can still program them to perform arithmetic calculations. On Macs you can use AppleScript , and I imagine something similar can be done with .COM files in Windows. I used IGOR , because it was convenient at the time. I first put up these moon tables in 1994, and updated them every year or so. Then I put up tables in 2001 for the following five years. I used to receive e-mails on them, but I no longer do. Presumably, folks have discovered other, superior resources for the same information. Since apparently this web page is not as useful as it used to be, I don't feel a strong need to revise it. That's why I went through ten years worth of calculations at once in 2005. In 2014, I extended them to 2025. When that year arrives, I'll have been providing these tables for 31 years; I'll see if I feel it's time to stop.